Safer and Sound. In the aftermath of the September 11 terrorist attacks on the World Trade Center and subsequent anthrax outbreaks, decision-makers at the New York City Department of Health and Mental Hygiene (DOHMH) took a new look at how environmental and radiation scientists and sanitarians gathered data following the events that would spawn a citywide public-health crisis. They found that some old methods no longer worked. Simple things, such as providing locations for survey meter measurements, were rendered impossible. Before 9/11, department responders used pen and paper to record sample identification information and locations of environmental data measurements such as chemical concentration or radiation dose rate measurements. The system she refers to uses the Intermec 760 mobile computer and Global Bay HazardPoint software for environmental emergencies. Global Positioning System (GPS) is used to automatically record address and landmark-dependent location information. Pen and paper are replaced by a wireless system designed to contain incident-specific data collection forms with GIS-based (Geographical Information Systems) city maps. Instead of bringing a disk back from the field for sensor data uploads, the system provides GPRS transmissions in real time. Developed to deal with emergency situations, the new system had its first big test in the summer of 2004. On the day before the Republican National Convention was set to open, DOHMH responders were called to a post office in midtown Manhattan. A contractor was performing industrial radiography testing on the building. This testing uses a radioactive source to look for flaws and stress cracks in the interior of the structure. The radiography machine malfunctioned, emitting low-levels of radiation inside the facility. At the scene, DOHMH and other responders began monitoring the dose rate inside and around the post office. The 760, with its Bluetooth connectivity, captures data using HazardPoint from a number of environmental survey metering devices that DOHMH routinely uses to test the environment for chemical agents and radiation hazards. This ability allowed the DOHMH team to gather readings remotely, putting only the equipment into harm’s way. The DOHMH put the Ludlum model 2241, which measures radiation dose rates, in the bay doorway of the post office, where the dose rates were at an elevated level. This allowed DOHMH personnel to step back about 40 feet while monitoring changes in dose rates to avoid potential radiation exposure. The Ludlum could update the mobile computer wirelessly with periodic readings, which DOHMH then could analyze and transmit back to a central server. As the learning curve for the new system flattens out, users anticipate sizable time savings in readying data for analysis. 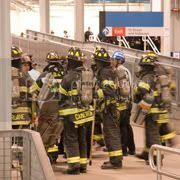 “With the old process, responders would be in the field, writing down or calling in data. Someone would be entering that into an Excel® spreadsheet and passing it around. That would take maybe five hours to complete,” said City Research Scientist Ed Connelly. The new system should do the job in minutes with increased accuracy. Sharing responder information with other agencies—police, fire, FBI—eventually will be accomplished by allowing access to the DOHMH’s secure HarzardPoint Web Management Console, where the data can be viewed over any Internet connection. The HazardPoint software is part of Global Bay AccessPoint mobile data collection platform. It allows authorized users to access field measurements, run reports and export data to other systems. Because the software is Web-based, with the main server behind a DOHMH firewall, DOHMH can securely access the system’s Web console from any personal computer with an Internet connection. Scientists can monitor responder data streaming in from the mobile computers and analyze middle-of-the-night incidents from any location. HazardPoint’s data collection capabilities support two-way synchronization. If, for instance, a DOHMH responder needs to capture additional information from an emergency scene, an electronic form can be up-loaded, modified with added data fields and saved. The next time the responder synchronizes his or her Intermec 760, the revised form will appear and the old form will be removed, ensuring that responders always have the correct forms available. In the end, the post-office incident turned out to have no terrorist link. DOHMH workers continued monitoring the site until the radioactive source was shielded and radiation levels returned to background levels. The contractor’s radiation exposure was what health officials described as below levels where “measurable health effects may occur. • The Intermec 760 mobile computer runs Microsoft Windows Pocket PC and has an integrated bar-coded label scanner, plus an attached Linkspoint GPS device. Where GPS satellite hookup is unavailable – indoors, for instance – the mobile computer contains electronic maps of the five New York City boroughs for pinpointing locations. • Global Bay’s AccessPoint platform allows development of specialized vertical applications, such as the HazardPoint software DOHMH is using to build and rapidly deploy forms between the mobile computer and the server. When the first planned system expansion is complete, DOHMH sanitarians will be able to take an Intermec mobile computer to a routine investigation—say for a reported outbreak of food-borne illness at a restaurant. They’ll take samples of possible culprits, such as tuna fish, salmon and milk. Each sample container will get a preprinted bar-code label identifying the contents. A sanitarian then will scan the label using the mobile computer, and the information will be transmitted wirelessly to both the department’s server and to the database of the Public Health Lab, where the samples will go for analysis. But New York City, after all, is the city that never sleeps. With help from Intermec and Global Bay, Connelly and his colleagues will do their best to make sure their response system is always alert, as well.